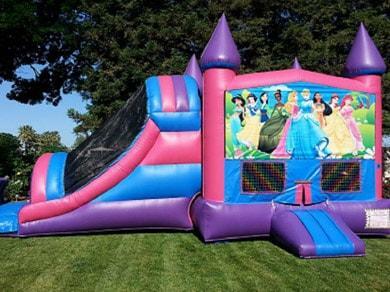 Thank you for visiting All Around Bounce; Fresno's leading provider of inflatable fun and quality party equipment rentals. 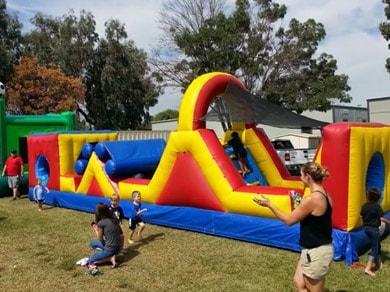 We are a locally owned and professionally operated business providing the greater Fresno area and Clovis with Bounce Houses, Waterslides, Obstacle Courses ,Combos and Carnival Games for any event big or small. 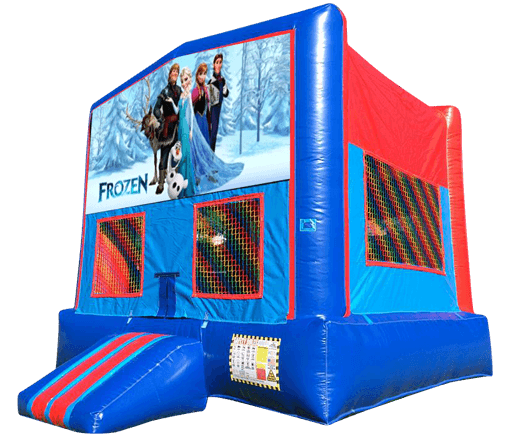 All Around Bounce is fully licensed and insured, and we guarantee a professional on time delivery with the best equipment available. 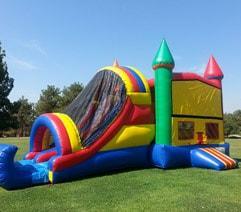 We want you to choose us because of our service, dependability, and of course our quality inflatables. Get ready for a summer packed with "Wet & Wild" fun from All Around Bounce! 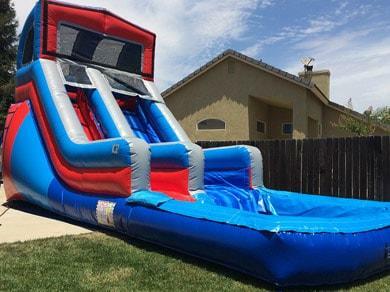 Follow the link below to see fresno's best selection of water slide rentals guaranteed to be your centerpiece attraction. When you're in charge of planning the carnival or fundraiser, you want experience and resources. 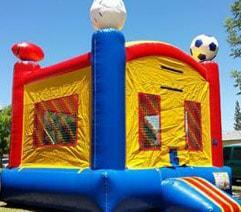 All Around Bounce has everything you need for a sucessful event. Call us for your custom package today! 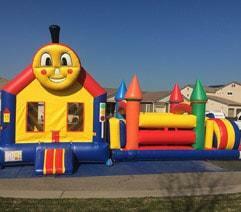 All Around Bounce House Company comes by its name honestly with Fresno's best bounce house rentals. Customize your bouncer with one of our awesome theme banners, then you can have your favorite cartoon characters host your party! 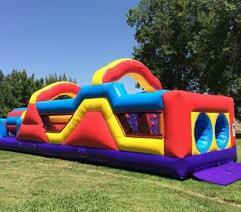 You'll get the best value for your bounce when you choose one of our exciting Combo Bouncer rentals. 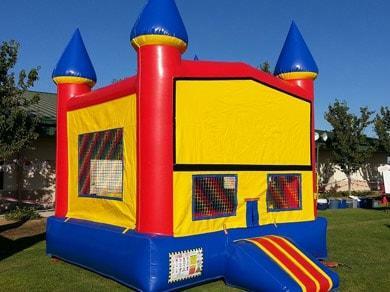 Combos get their name from being a "combination" of the popular bounce house and additional elements like climb & slides. At All Around Bounce this is our favorite category! 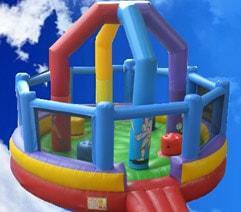 Here you'll find the best of the best of our inflatable attractions. 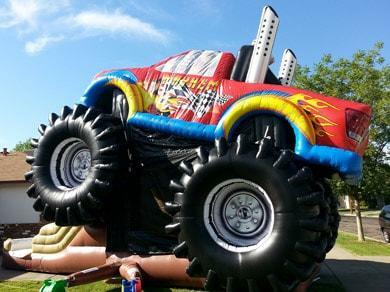 Choose extra large inflatables like the Monster Truck or Heavy Hauler Slides. Take to the seas with a pirate ship! 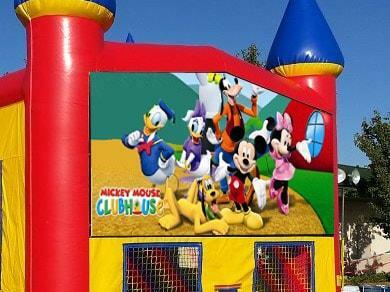 What could be more fun than to see your favorite cartoon and movie characters ready to welcome all your guests to the bounce of a life time! With our custom party theme banners you can pick from Dora, Frozen, Avengers and many more! 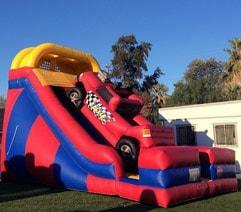 All Around Bounce has Fresno's best selection of water slide rentals. 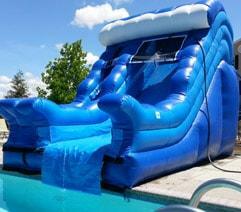 Big, Bold and exciting; we even have a slide rental you can setup next to the pool! Make sure to see the 50ft Tsunami Slip n Dip, it's as awesome as they come! 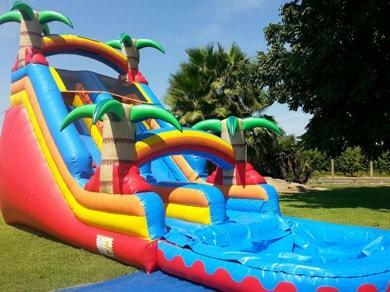 Our inflatable dry slide rentals are the perfect choice for Freno parties and events where water use is not appropriate. These big, colorful slides are every bit as fun as their wet brothers and can be used indoors where space allows. Perfect for schools, churches, even company team building activities. 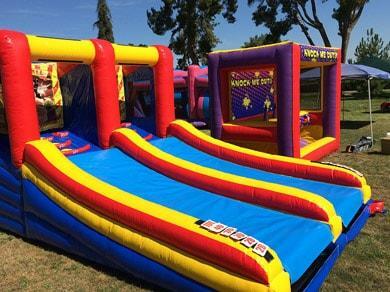 These large inflatable challenge courses will bring your guests together in the spirit of fun and friendly competition as players race through the course obstacles. Step right up and try your luck! Rent one or rent them all; our carnival game rentals will help you create that old-fashioned midway atmosphere at your event. 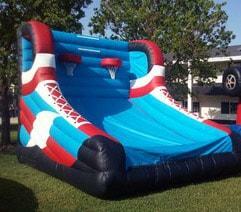 These inflatable skill games are great for all ages so everyone has fun! 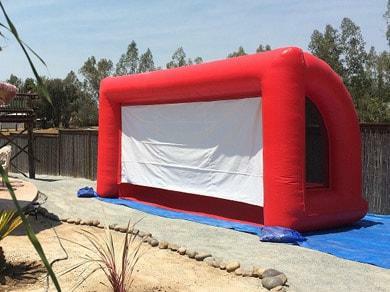 Pop up some popcorn and great ready for "Movie Night" under the stars with our large inflatable movie screens. Or maybe your in charge of the fundraiser and need a good attraction... Our Dunk Tank rental is a tried and true success!